Each week I set out to prove that I'm not a poser. I'm not some fake, catfisher trying to fool any readers into thinking I'm perfect. In the process of being all real and nonposer-ish, I wouldn't mind being thought of as crafty or brave (this week it might be more brave than crafty). This week I bravely attempt an out-of-character, cutesy thematic pizza--Angry Birds. Because who doesn't love an angry bird? And pizza? The fun/bravery doesn't stop with pizza this week. 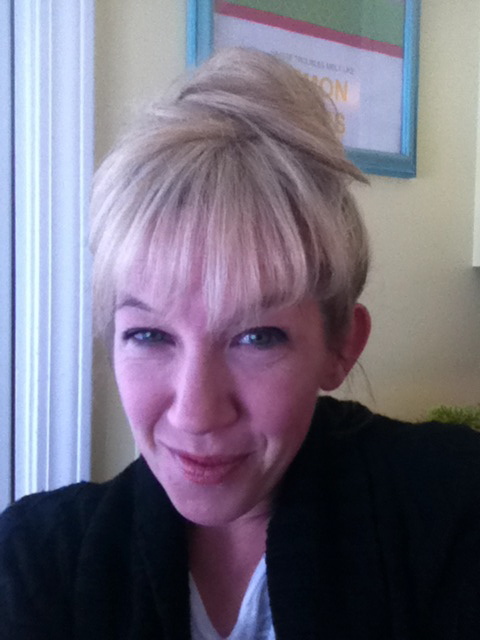 This week I went all Michelle Obama and got bangs--fake, Pinterest-showed-me-how-to-do-it bangs. 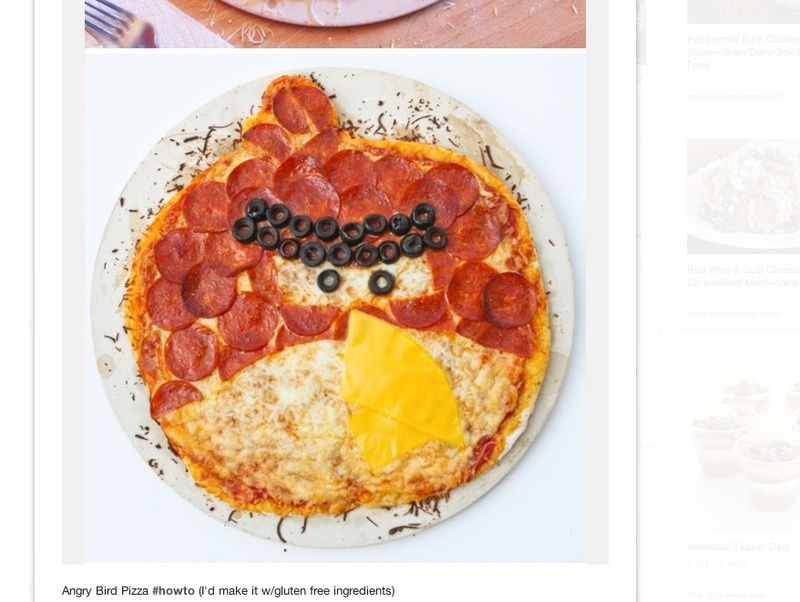 My Angry Birds Pizza was a fail. Whomp. Whomp. It wasn't for lack of trying. Lucy and I studied the pictures online and carefully sliced each pepperoni and placed it in its proper spot on the pizza. But what about my bangs? I've been asking my hair dresser for more of a bang (a subtle longer layer if you will) since my forehead wrinkles began deepening. Bangs are cheaper than Botox right? But since Michelle Obama debuted her new bangs, I've been a little obsessed with the what ifs. What if I just went ahead with the blunt full-on bangs? What if I could cover my forehead wrinkles? What would it look like? Then low and behold I see a no-cut bangs tutorial online. Click here to see the full tutorial at the amazing web site myshineproject.com. So I thought I'd give it a try. And, well, um, I looked less cutesy, model posing with my new fake bangs/updo and more like a bouffant-y, waittress from Mel's Diner. That's me on the right. Aww, remember Flo. I loved her. 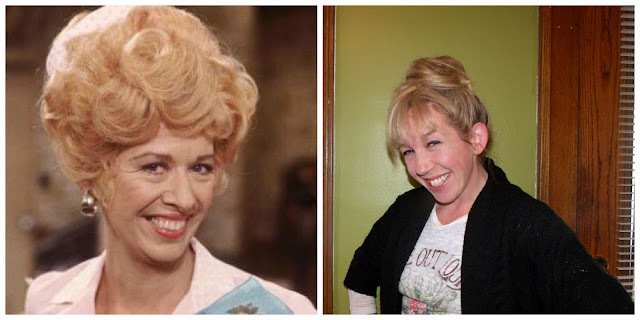 Maybe that's why I was channeling her as I created my updo. The tutorial was good. Basically all you have to do is pull your hair forward for the bangs and then pile the rest up on top of your head in a "hip" bun. Secure it all with a million bobby pins. Simple. I just don't have a lot of hair fixing/styling skills or a mirror where I can see the back of my head. 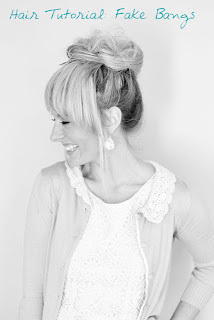 I also needed longer hair for this particular bangs/updo tutorial. My husband was NOT a fan of my bangs. But you know what I told him? I told him to "kiss my grits" just like good old Flo from the sitcom Alice. I wore the bangs/updo for the rest of the day and kind of loved them. Or maybe I just loved playing the character of Flo because you know I did that for the rest of the day too. I think if I was really going to go outside of my house with fake bangs, I would ask a professional to help me. For now I'm going to bravely stick with my very real forehead wrinkles, no-bangs look. Have you made something from Pinterest lately? Please share what you're working on in the comments here or over on Facebook. Click here to check out last week's DIY Subway Art. 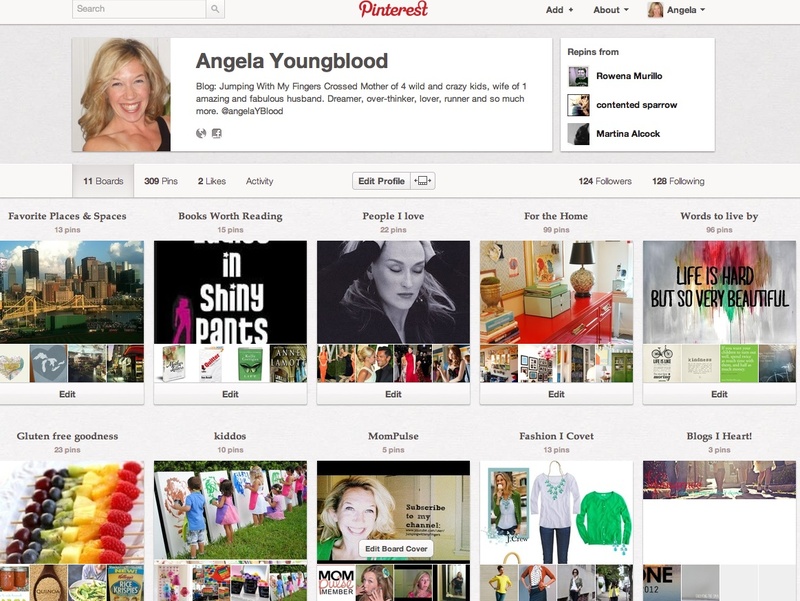 Come on over and follow my Pinterest boards.